There has been much hoopla of late about autonomously-driven trucks, which can take most of the driving responsibilities out of the hands of the driver, potentially improving safety and efficiency. But let’s not kid ourselves, this technology is still a long way off. Well, it’s not the technology that is futuristic, but the governments’ and public’s willingness to share existing roads with self-driving trucks will be a difficult obstacle to overcome. Seen through the camera, this may look like more than 13m separation, but that’s the distance Peloton’s DATP system rather precisely maintained during our Detroit demo ride. That said, truck platooning may well offer a bridge between today’s transportation system and one in which trucks are operated autonomously. When I received an invite to witness first-hand a truck platooning demonstration, I was disappointed to find it conflicted with a previous commitment. But I didn’t want our readers to miss out on it, so I sent veteran automotive journalist Dale Amy to cover the demonstration for us, in what marks his Truck News debut. (Welcome aboard, Dale)! 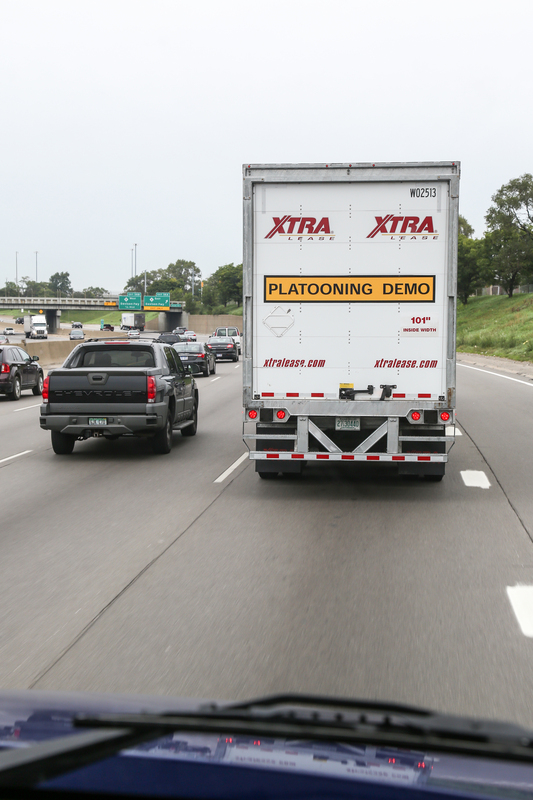 In short, truck platooning uses vehicle-to-vehicle communications to allow trucks to travel more closely together, the lead truck instantly alerting following vehicles to its brake applications so that following distance can be shortened by as much as 30 metres. This allows the trucks to run as a pack, taking up less road space, reducing the likelihood of rear-end collisions and also improving fuel-efficiency for the following trucks, which can effectively drive in the slipstream created by the lead trucks. Well, obviously I wasn’t there, so I’m just going to send you over to Dale’s report, which we posted last week. Dale noted it was a tad unnerving to follow so closely behind another big rig. I suspect the view kinda sucked as well. Nonetheless, it’s an interesting use of technology that could change how we transport goods in the not-too-distant future.